New Delhi: President Pranab Mukherjee has said attacks on Africans coming to India is "not tolerable" and that India's relationship with the African countries is close. Expressing "deep" concern over the reported attacks on African nationals recently, Pranab wondered why Africans are feeling unsafe in India. Addressing the delegates of 7th Annual Heads of Mission Conference who called on him on Monday, the President said, "It would be most unfortunate if the people of India were to dilute our long tradition of friendship with the people of Africa and the welcome we have always extended to them in our country. African students in India should have no reason to fear for their safety and security." "Mahatma Gandhi made his experiment of 'Satyagraha' on the soils of Africa; he transformed our country. Therefore, how can we tolerate this? How can we even comprehend it? 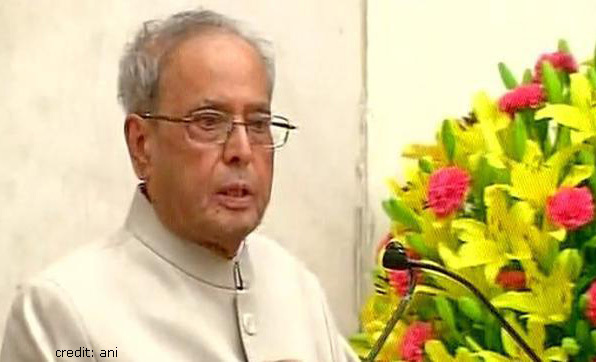 Should Africans not feel safe in India," asked the President. Appreciating the government's action on the issue expressing satisfaction over the prompt action, President Mukherjee said: "I'm happy that the Government of India took prompt actions; I appreciate initiatives taken by the Sushma in consultation with Home Ministry and others." According to a press release, the President said that recent attacks on African students were extremely painful to him personally because he as a student, political activist and MP has seen first-hand how India and Africa have always been close partners. It would be most unfortunate if the people of India were to dilute our long tradition of friendship with the people of Africa and the welcome we have always extended to them in our country. African students in India shold have no reason to fear for their safety and security. He expressed appreciation that the Ministry of External Affairs in consultation with Ministry of Home Affairs is pro-actively following up on the few isolated incidents that have occurred and working closely with authorities to ensure the safety of African students in India. The President said the bonds between the people of India and the people of Africa have been forged since time immemorial. Rabindranath Tagore wrote a poem in great anguish about how evil was apartheid. Leaders like Gamal Abdel Nasser of Egypt and Kwame Nkrumah of Ghana stood shoulder to shoulder with Jawaharlal Nehru at the Afro-Asian Conference in Bandung in 1955 and in founding the Non- aligned Movement in Belgrade in 1961. Nelson Mandela was an embodiment of Gandhian principles. India led the long international struggle for the end of colonialism and apartheid in Africa. India under Nehru had no hesitation in breaking trade relations with South Africa in 1946 even though it constituted nearly 5% of our global trade. It was only in 1994 after the end of apartheid that he as Commerce Minister restored normal trade relations. Whole of India stood in support of African leaders like Jomo Kenyatta, Julius Nyerere and Kenneth Kaunda during this freedom struggle. India has had trading relations with African countries for centuries and every one of the 54 countries of Africa has a thriving Indian community doing business, industry etc. The President said the most well known Non-Resident Indian was Mahatma Gandhi who made his first experiments with Satyagraha in South Africa. Gandhiji was presented to India by South Africa. India’s relations with Africa should not be jeopardised in any way. No impression which is not in line with our ethos or core values of our ancient civilization should be created. Appropriate awareness of India’s age old historical relations with Africa must be created in the minds of our youngsters. Addressing the issue of terrorism, the President said that it is a menace which needs to be collectively tackled by the world community with resolute determination. There is no good terrorist or bad terrorist. Comprehensive cooperation by all countries of the world is essential to tackle this global menace. The President called upon the Heads of Mission to do their best to expand contacts between higher education institutions of India and foreign countries. He also asked them to identify ways and means to strengthen research and innovation in the country. The President said the HOMs’ Conference was first held in 1961 when Pt. Jawaharlal Nehru was the Prime Minister of India and also the Foreign Minister. He had a nostalgic association with this Conference because after the practice of holding such Conferences fell into disuse,he as Foreign Minister revived it in 2008. He was happy to note that the Conference has now become an annual feature and provides excellent opportunity for comprehensive interaction to take place. The President said the Indian Foreign Service was built with great care and nurtured by mighty brains. He was proud of his past association with MEA by virtue of having been External Affairs Minister twice. Earlier, Minister of State for Home Affairs Kiren Rijiju on Monday dubbed the recent attacks on African nationals of South Delhi as 'unfortunate'. Rijiju said the government will try its best to avoid such episodes in the future. "After what has happened with the African students in Delhi, we are holding regular meetings to come up with ways to sensitize the local populace," Rijiju said. "Arrests have already been made and the foreign ministry is also looking into the matter along with us. I also had a meeting with the Union Home Minister Rajnath Singh to discuss the same," he added. A week after the killing of a Congolese man in the national capital that stirred a diplomatic row and instigated violence against Indians in Congo, four attacks on African nationals by the residents in Chattarpur were reported on Friday. Five people were arrested by the Delhi Police in connection with the four attack incidents on the African nationals on Sunday. The African nationals had sustained minor injuries in the attack that took place in South Delhi's Mehrauli area on Friday. The accused who have been arrested are identified as- Babu (32), Kunal (20), Om Prakash (24), Rahul alias Rocky (24) and Ajay (25). The police are carrying out search operations to nab the other accused persons. On Sunday, External Affairs Minister Sushma Swaraj spoke to Rajnath Singh and Delhi Lieutenant Governor Najeeb Jung about the attacks and said she was assured that the culprits would soon be arrested. "They assured me that the culprits will be arrested soon and sensitisation campaign will be launched in areas where African nationals reside," she tweeted.